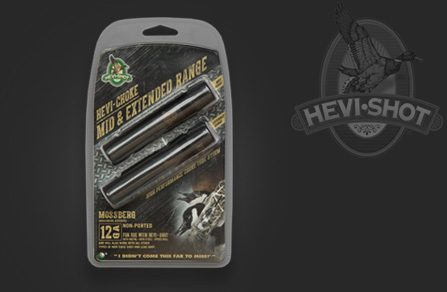 In addition to world-class ammunition for your needs, HEVI-Shot also offers the best chokes for your hunt, with gun-specific, game-specific styles available for most gun models. Manufactured from aircraft quality 17-4 stainless steel, they’re guaranteed for a lifetime. With a knurled fore-end, you can leave your choke wrench at home, changing tubes in a field is easy! Available in Mid-Range (out to 40 yards) and Extended-Range (past 40 yards). Available in 12 and 20 gauge, in ported and non-ported versions, HEVI-Choke™ waterfowl choke tubes helps you squeeze every bit of performance from your HEVI-Shot® ammunition. P.S. If you don't see the chokes for you gun, give us a call at 307-333-4810 and we will get it for you. **SALE** Normally $120, NOW $79.95 PLUS FREE SHIPPING! Choke Tubes for Invector Plus, Win SX2, SX3, Supreme threads. FREE SHIPPING!